Knowing how to make dump cake from scratch is a valuable skill to have. Forgive the name but dump cake literally just requires dumping ingredients in a pan and baking them. This blueberry dump cake from scratch is a delicious, perfect summer recipe, and you probably have all the ingredients you need! First of all, let me apologize to you for the name of this recipe. I hate the term “dump cake”. I mean, I get that it is called that because you literally dump the ingredients into a pan and bake them, but GAH. It just sounds very unappetizing. Ditto for “dump dinners” (I have seen a cookbook in my favorite local used book store with this name and I. Just. Can’t.). But alas, when you write a blog you have to give the people what they are looking for, and according to Pinterest and Google, people are looking for dump cakes. Or, if they are like me, they are looking for “dump cake from scratch”. Maybe some other ingredients like canned pineapple, brown sugar, etc., but these are not necessary. And you guys know me…I have an insatiable need to make everything from scratch (i.e. without a mix or a can). Mostly because I know that I am always going to have some sort of fresh or frozen fruit, butter, and dry ingredients for a cake in the house. But also because I really do, at least in theory, try to avoid processed food as much as possible (though I have not been as good at this lately. Stress, am I right?). I did a little poking around the interwebs trying to figure out how to make a dump cake from scratch. I found a recipe on Simply Recipes and riffed on that a bit. My filling follows their formula but my dry cake is actually a divided recipe for yellow cake from the book The Perfect Cake from America’s Test Kitchen, which I somehow miraculously managed to score the Kindle edition of last week for $3.99. A miracle indeed, because ATK books never go on sale! Easy, right? And because when I use a bowl for dry ingredients I just wipe it out with a towel and put it back, the only dishes that I dirtied were the pan and the bowl I used to melt the butter. 100% worth it for this delicious dessert that is perfect for summer and that, by the way, I baked in my Breville Smart Oven so I didn’t even have to heat up my kitchen. Oh yeah – vanilla ice cream is non-negotiable. Don’t even try. Click here to save this recipe to your Pinterest baking or cake boards! This post contains affiliate links. This means that if you click the link and make a purchase from Amazon, I will receive a small commission. This does not affect the cost to you. For more information, please see my disclosures. Thank you for supporting my blog! This recipe is adapted from Simply Recipes and from the book A Perfect Cake from America's Test Kitchen. Preheat the oven to 375? Fahrenheit. In a 9x13 inch pan, combine the fruit with the sugar, cornstarch, and salt. In a large mixing bowl, whisk together the flour, sugar, baking powder, baking soda, and salt. Sprinkle the dry cake ingredients evenly over the fruit mixture. Use a spoon to drizzle the melted butter evenly over the dry cake mixture. Bake the cake for 35-45 minutes, until the cake is light golden on top and the fruit is bubbling. Frozen fruit may need to bake slightly longer (my fruit was frozen and I baked my cake for 55 minutes). 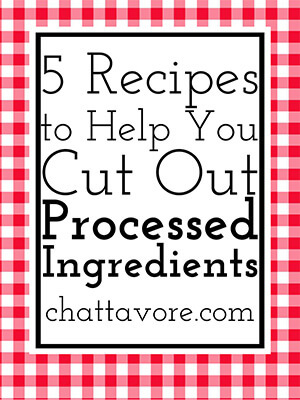 There may be a few small patches of dry ingredients on top. I just smoothed these with a spoon. Cool the cake for at least an hour before serving. I know that this is a difficult step but eating the cake too soon will result in unpleasant mouth burns! Vanilla ice cream is non-optional! Apple blondies with walnuts and whiskey caramel are (1) rich; (2) decadent; (3) perfect for Fall; and (4) made in one bowl. ONE BOWL! Scroll down for the video. Apple Blondies? Yep, apple blondies. With walnuts. 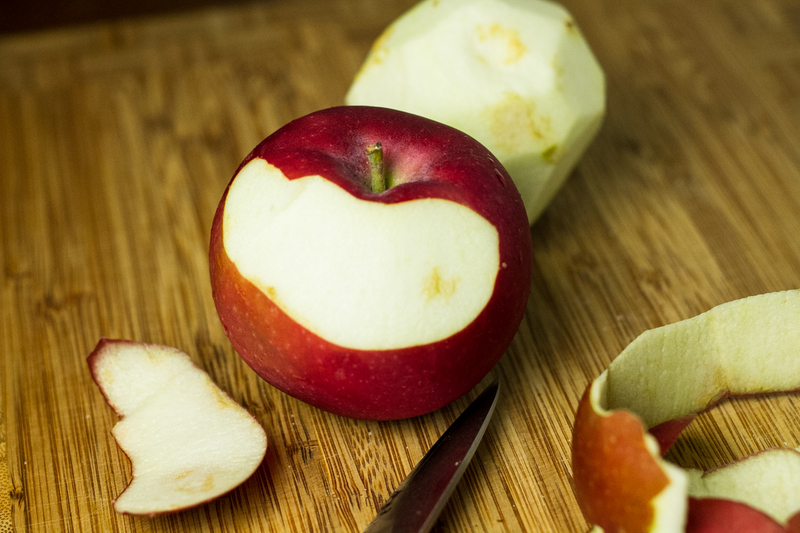 Maybe I’ve mentioned here a time or two that apples are pretty much a quintessential Fall food for me? One day recently I was struck with the need for a chewy, cinnamon-y bar cookie full of apples. 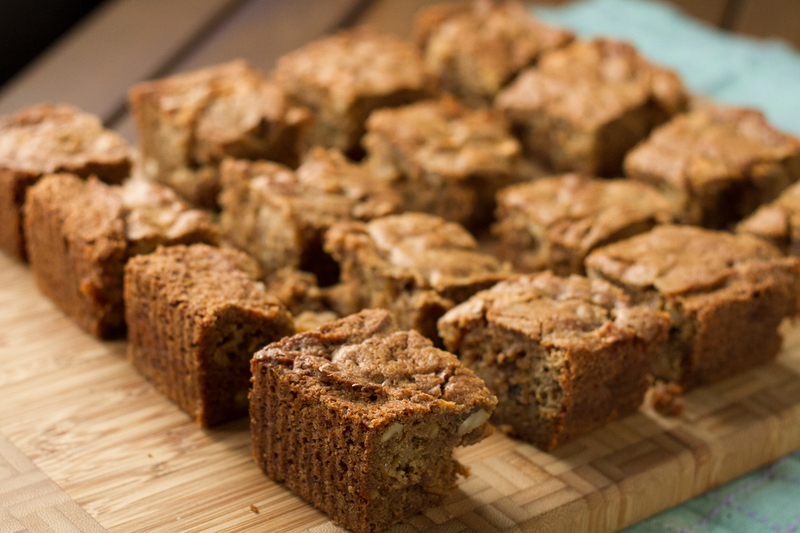 Apple-walnut blondies. And they would be topped with caramel sauce. With salt. And whiskey. Definitely whiskey. It didn’t take me much digging to find a recipe that was perfect for adapting to make exactly what I needed. Yvonne Ruperti’s book One-Bowl Baking has a whole section devoted to bar cookies, which makes sense because what use is a bar cookie if it isn’t easy? Brownie, blondies, lemon squares, magic bars…they are perfect desserts because they come together quickly and don’t require rotating through cookie sheets over and over and over. It took a little playing around to get the recipe right…turns out that when you throw a couple of apples into the batter it adds enough volume to require 15 or 20 more minutes of baking. No biggie, though. That just gives you a little extra time to stir together the caramel, which I promise you won’t want to omit. Though you can leave out the whiskey (I used Chattanooga Whiskey, by the way) if you must. And the salt, though I really have no idea why you would do that. 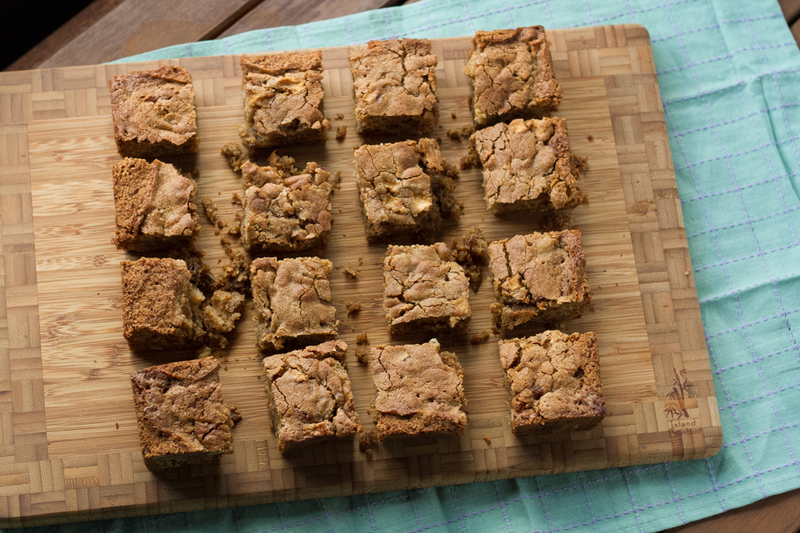 Another thing…if you bake these apple blondies in an 8×8 pan you will look at the pan and think to yourself, “Maybe I should just cut nine squares.” Don’t do it. If you do, you will end up with a stomach ache. No one really ever thinks of fruity desserts as rich, but this one, full of butter and white sugar and brown sugar, is, especially when accompanied by homemade caramel and some ice cream (not pictured…it really doesn’t need ice cream at all). After the 9-bar debacle, I made these again and took them to work, this time cut into 32 pieces. I came home with 4 pieces. I’d call that success. I didn’t share my caramel, because I wanted to hoard it in my fridge for dipping apples and pear slices and spoons into. And that’s exactly what I did. 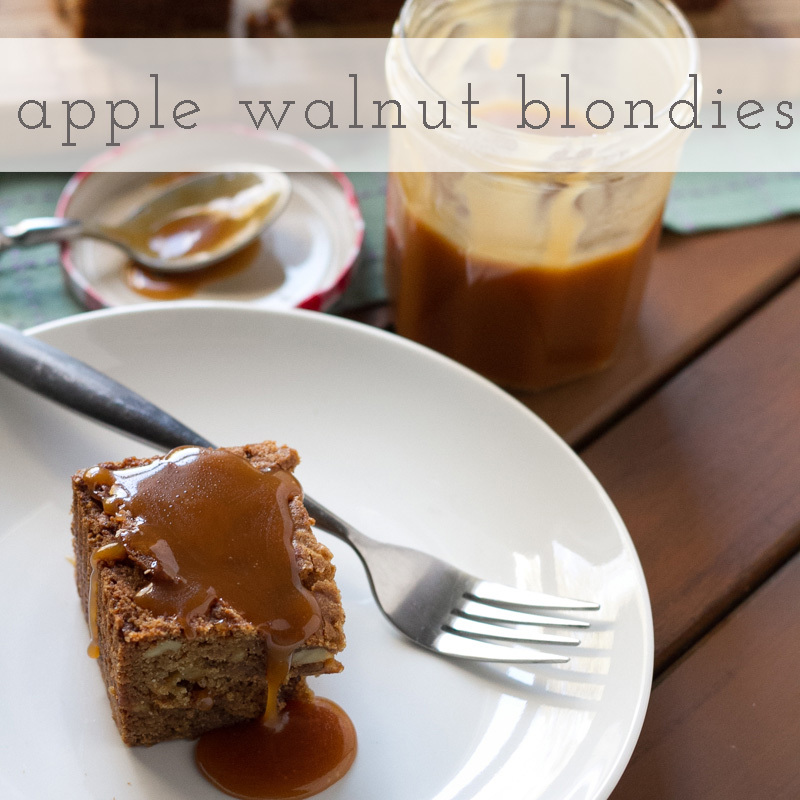 Apple blondies with walnuts and whiskey caramel are perfect for a get-together or just a fun snack or dessert for your family! Click here to save this recipe to your Pinterest Fall and Baking boards! The blondies are adapted from the book One-Bowl Baking by Yvonne Ruperti. 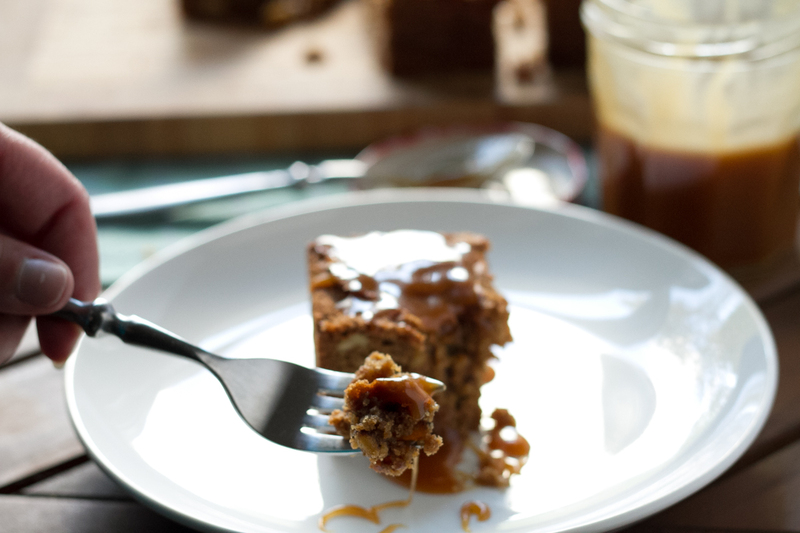 The caramel is adapted from Sally's Baking Addiction . For the caramel: using a wooden spoon, stir the sugar in a medium saucepan over medium heat until melted and light golden in color. Be sure to stir constantly and don’t let it burn! Add the butter, one tablespoon at a time, stirring each until melted before adding the next. Be careful as the sugar will bubble when add the butter and boiling sugar is essentially the same as boiling hot lava. Once all the butter is melted, add the heavy cream and, with the heat turned off, the whiskey. Turn the heat back on and boil for one minute, continuing to stir constantly. Remove from the heat and stir in the salt. Allow to cool until no longer molten before serving. Preheat the oven to 350 degrees. Liberally butter an 8-inch square baking pan. In a large bowl, use a sturdy spoon to stir together the butter, brown sugar, salt, and vanilla until well combined and smooth. Add the eggs, one at a time, and stir until completely combined. Add the flour, baking powder and baking soda, and cinnamon. Stir until well combined. 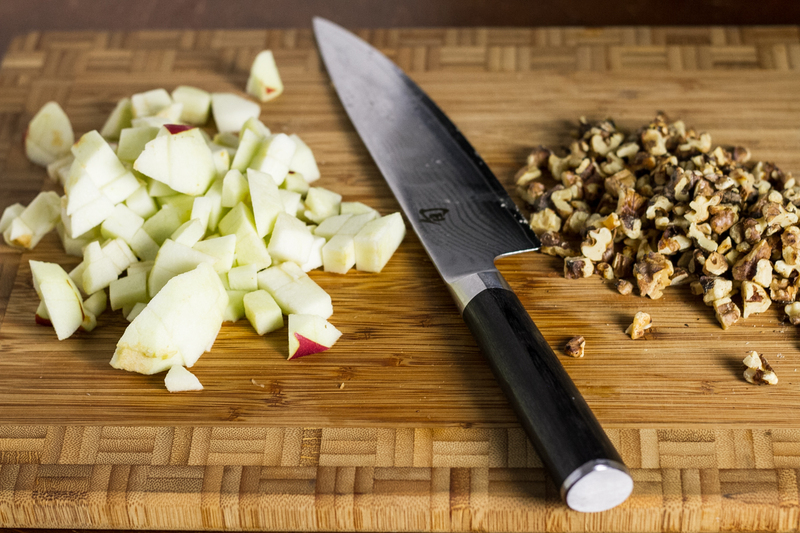 Fold in the apples and walnuts. Spread the batter in the prepared baking pan. Bake for 35-40 minutes, until a toothpick inserted in the center comes out clean. Allow to cool completely in the pan then cut into 9 or 16 pieces. Serve with warm caramel. 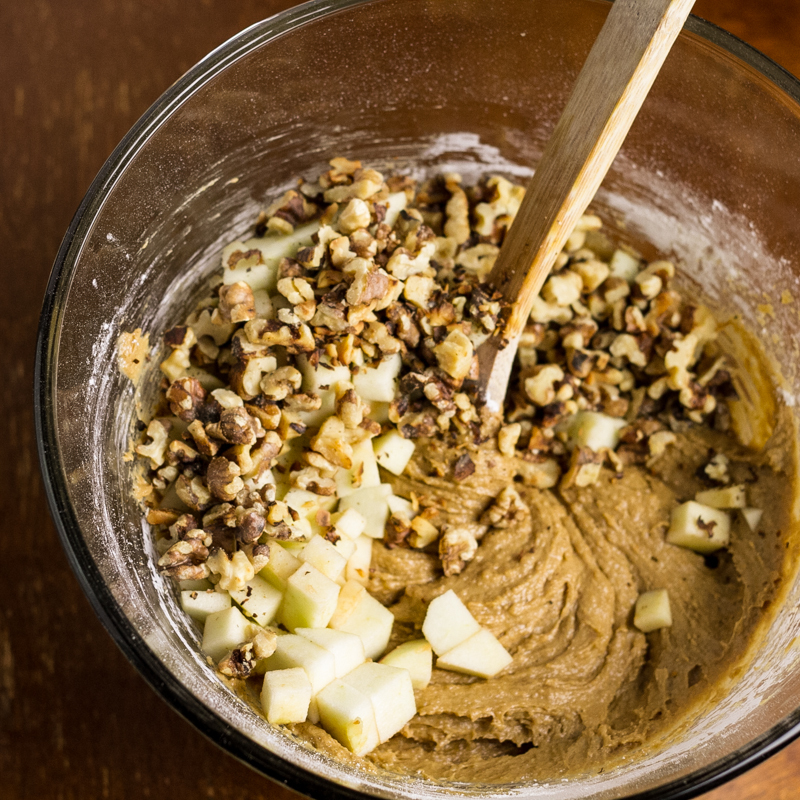 Print the recipe for apple-walnut blondies! 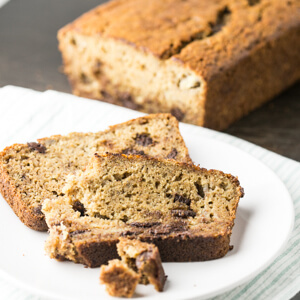 Banana beer bread with chocolate chips is a delicious and simple to make bread that is just sweet enough for dessert but you can eat it for breakfast too! Scroll down for video. Do You Make Banana Bread? Weird, right? Banana bread is one of those super-basic things that everyone makes. But I really never do. I mean, until now. Because what else are you going to do when you have four super-ripe bananas about to start attracting flies in your kitchen? You get your husband to bring a brown ale home from work and you make banana beer bread. Yep. Plus chocolate chips, because in my humble opinion banana bread is always made better by the addition of chocolate. I was pretty concerned that this banana beer bread would turn out too wet. There is a lot of liquid in there. It turned out perfectly, though – so moist and sweet enough for dessert but wholesome enough for breakfast (because bananas and whole wheat flour). 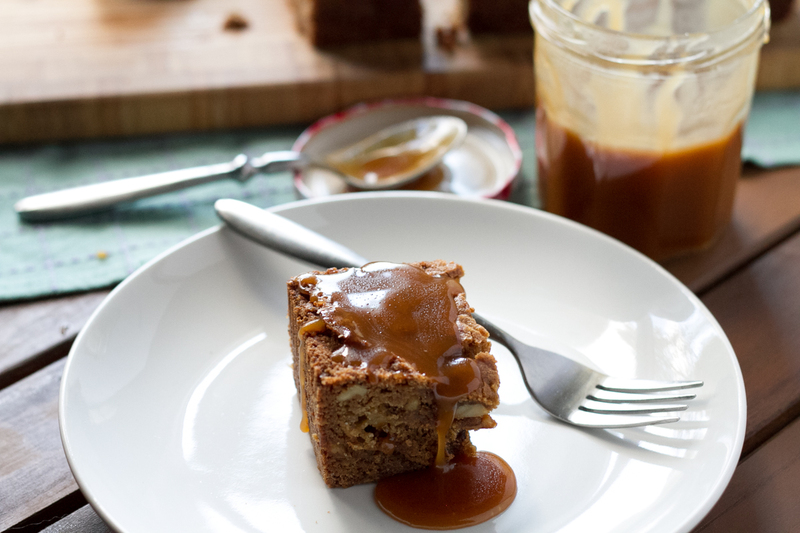 Put your banana beer bread in the fridge, though. I didn’t. It did not end well. Click here to save this to your Pinterest baking and breakfast boards! Since I made this banana beer bread, maybe I’ll up the ante on my banana bread making game. Banana bread is one of the few ways that I can get Philip to consume bananas, and if beer is included, even better (the brown ale that I used was Maduro Brown Ale from Cigar City Brewing, and I have also had great luck with Dogfish Head Indian Brown Ale). This recipe was shared on The Weekend Potluck on The Country Cook! Preheat the oven to 350?. Spray a 8 1/2 x 4 1/2 inch loaf pan with nonstick spray or grease with butter. In a large bowl, whisk together the flour, baking soda, and salt. In a medium bowl, mash the bananas then stir in the butter, eggs, brown sugar, and beer. Pour the banana mixture into the flour mixture. Add the chocolate chips and stir until no dry spots remain. Pour into the prepared loaf pan. Bake the banana bread for 55 minutes to an hour, rotating the pan halfway through baking. When the bread is done, a toothpick inserted in the center should come out clean. Cool the bread in the pan for 10 minutes, then remove from the pan and let it cool completely before serving. This post contains affiliate links. This means that if you click a link and make a purchase, I will receive a small commission. This does not affect the cost to you. For more information, please see my disclosures. Thank you for supporting my blog!